As aTeach for America (TFA) Charter Corps teacher, TEACHED Producer/Director Kelly Amis taught in an elementary school in South Central, Los Angeles. That is where her passion and commitment to education equality began. The TEACHED film series is a reflection of that continuing drive to help the general public “see” what goes on in urban public schools every day and hopefully become inspired to join the fight for transforming the education system so it serves all children well. Over the last year, Kelly has found new levels of support from the organization she credits with steering her career towards work in social justice and equality. First, there was the Teach for America Social Innovation Award, which Kelly won (!). This competitive award gave Kelly $50,000 to further develop TEACHED and many additional gifts including a free Dropbox business account and pro bono advice from a dynamic duo of non-profit development experts called Arbor Brothers. Since the award was announced last spring, more Teach for America members have stepped up to host TEACHED screening events, including in New York, Chicago and Sacramento. TFA New Yorkhosted a screening ofThe Path to Prisonas part of their"What if we..."series. The night included a panel discussion and small group sessions where audience members brainstormed and then shared strategies for change around the question: “What if we….eliminated the school to prison pipeline”? TFA-NYC then worked with Leadership for Educational Equityto organize afollow-up eventfor interested attendees to further develop and begin implementing aplan of action for change in NYC. We are thrilled to watch these variations and ideas develop on how best to use the TEACHED films to organize communities for making change and are excited to share this alternative—showing one film at a time, going into the issues it raises deeply and over several meetings—with those planning screenings in 2014. If you are interested in hosting a TEACHED screening, go here for more details or questions contact Cristina Moe Salanova at cmoe@teached.org. TFA Sacramentohosted a packed-house screening ofThe Path to Prisonat the Guild Theater followed by a panel discussion and audience Q&A on California's issues with the under-education and over-incarceration of minority males in particular. We've heard from many Sacramento parents and community leaders since the screening who plan to organize their own grassroots events and look forward to working with them. 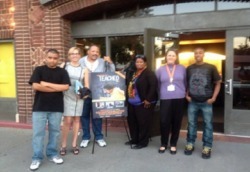 The TFA Sacramento team is planning events around the other twoTEACHED Vol. Ifilms for 2014 with some incredible guest speakers lined up. Check our eventspage for details as we get them. To learn more about Teach for America, go here. TFA Chicagohosted two TEACHED Vol. I screenings, one at a local school for parents, teachers and TFA alumni, the other atNorthwestern University's School of Education and Social Policy. Thanks to all the TFA staff who helped organize these events andStudent for Education Reform's Tanesha Peeplesfor participating. Read an article in The Chicago Bureau about the Northwestern screening HERE. The TEACHED team is very grateful this holiday season to have partnered with such an exceptional organization. Thank you to all the TFA members that helped share the films and discuss education equality within their communities! Posted on December 5, 2013 by Loudspeaker Films and tagged Education Reform Loudpeaker Films TEACHED TFA Chicago TFA New York TFA Sacramento TeachForAmerica KellyAmis.